The Fijian Warriors side were presented with a new set Jerseys from their sponsors Swire Shipping at Walu Bay in Suva, yesterday. Swire Shipping Regional Manager – Pacific Islands, Chris de Villiers was proud to sponsor the Fijian Warrior’s side. “We are proud to be associated with Fiji Rugby Union and the Fijian Warriors. We believe the sponsorship will allow us to further develop our community development programme as we hope to do more sports based stuff,” de Villiers said. “And we are certainly looking forward to working with the Fijian Warriors team when we will be starting with our community outreach programme. “We also look forward to seeing the players in their new jerseys and I am sure they will do both the jersey and the country proud. Fiji Warriors Head Coach Senirusi Seruvakula was appreciative towards Swire Shipping for their support. 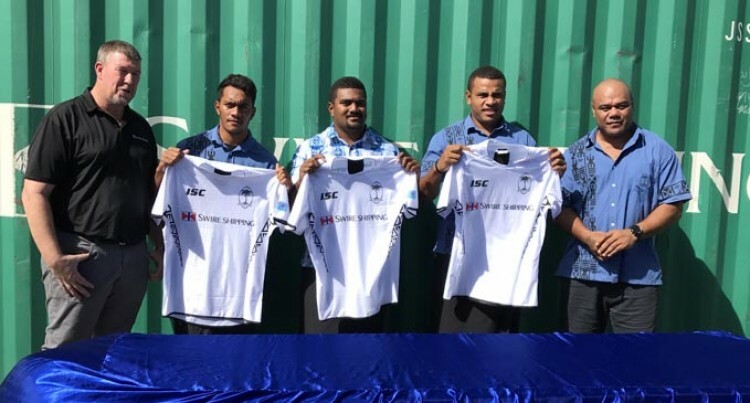 “I would like to take this opportunity to thank Swire Shipping for coming on board for the first time as partners with the Fijian Warriors team, especially as you know the Fijian Warriors consists of all the local players who will be competing in the international competitions,” Seruvakula said. He also added the side will be marching into camp today before they fly out next Tuesday for Uruguay to compete in the Nations cup. “This competition is sanctioned by World Rugby,” Seruvakula added. “The team departs on May 29 and our first game is on Saturday against Uruguay and they are also in the same pool with the Flying Fijians in the 2019 World Cup. So, it is a big task for our local boys to play against Uruguay’s national team. “And our second game is against Argentina on the following Wednesday and then on Sunday we play the Italy in our third match and return to Fiji the next day on Monday. “So, basically it is just a short turn around and a good exposure for our local talents and look forward to the challenge ahead of us and we hope to make Fiji and our new sponsors Swire Shipping proud,” Seruvakula said.